To the unaided eye, a little fire ant is not much more than a speck of dust. At 2 millimeters long — the size of a number on a penny — these tiny ants often go unnoticed until colonies become so large that humans and animals encounter a barrage of stings. While the ants are present on Maui, they are not widespread. But experts suspect other colonies may exist and, despite the heroic efforts of state agricultural inspectors, occasionally pests slip through our quarantine system. Finding little fire ants early is essential for eradication, but therein lies the challenge: How to find what is nearly unfindable. Across Maui, there are hundreds of people already looking for small pests every day but they aren’t state inspectors or invasive species workers. Rather, they include the groundskeepers and landscaping teams that keep resort and hotel grounds looking their best. They work with trees, plants, soil and flowers — some of which may have been imported from little fire ant-infested areas elsewhere in Hawaii. Thanks to the Aloha Aina program of the Hawaii Tourism Authority, these groundskeepers and the hotels where they work are joining the effort to stop little fire ants from taking over our island. Experts with the Hawaii Ant Lab and Hawaii Department of Agriculture, along with members of the landscape industry, provided insight into the most effective ways to prevent little fire ants from reaching hotel and resort properties. Surveys with industry representatives highlighted information gaps — many landscapers don’t know what little fire ants look like. Based on that discovery, MISC created the Little Fire Ant Prevention Partner program to train staff on basic ant identification and encourage hotels to adopt best-management practices to ensure early detection of little fire ants. To become a partner in the program, a business agrees to implement a training program for landscaping crews on little fire ants. Each participating business pledges to incorporate either an annual test of its property for little fire ants or to test incoming plant materials and soil. These steps will help ensure that hotels and resorts remain free of little fire ants. Participating businesses receive a poster showing how to identify common ants on Maui and little fire ants and a kit with supplies for testing — peanut butter, wooden sticks, labels and envelopes for submitting samples. MISC has also searched 55 hotels and condominiums on Maui for little fire ants with an impressive result: No little fire ant populations detected. This positive news means Maui still has a chance to keep our island from being terrorized by one of the world’s worst invasive species. 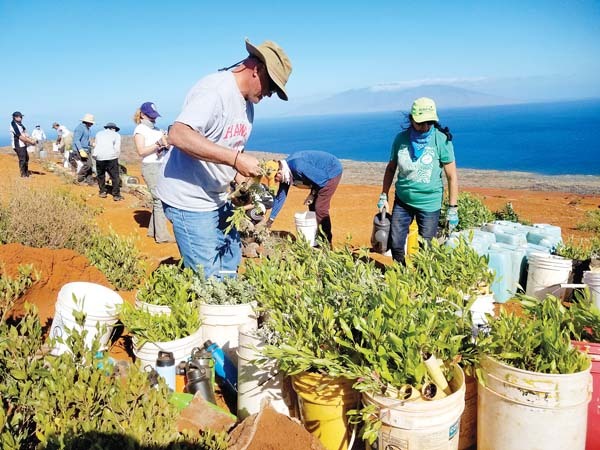 The Maui Invasive Species Committee is continuing to roll out a program for hotels and resorts and the benefits could be far reaching. 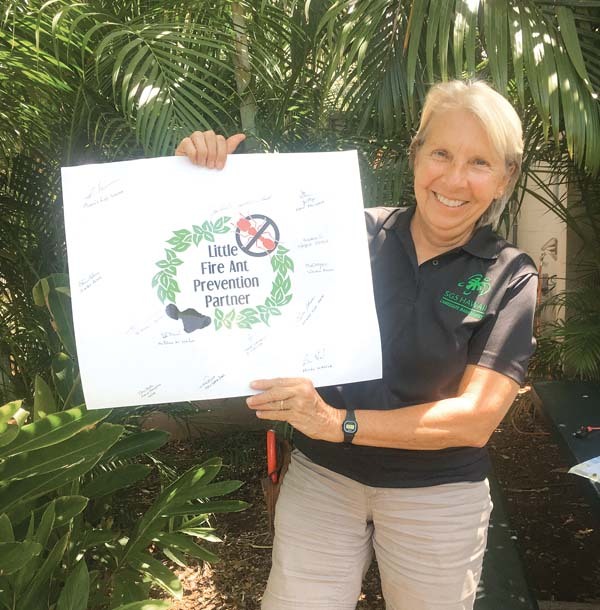 “By sharing information with hotels and employees, this can make a difference in our communities and to our aina,” says Elaine Malina, landscape manager at the Andaz, a Little Fire Ant Prevention Partner. A list of participating Little Fire Ant Prevention Partners will be regularly updated at mauiinvasive.org/lfa-prevention-partner/. The ant-identification poster is also available online. For the current status of little fire ant populations on Maui, visit www.stoptheant.org.